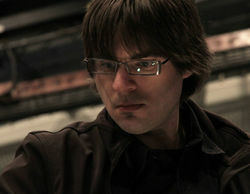 Dr. Nicholas Papador is Assistant Professor of Percussion at the University of Windsor and holds the position of Principal Timpani with the Windsor Symphony Orchestra. An active performer specializing in contemporary music, he is a founding member of Marassa Duo and Noiseborder Ensemble, and was featured as an on screen performer in Matthew Barney’s KHU, act 2 of his seven part film/opera, Ancient Evenings. He has presented at four Percussive Arts Society International Conventions, two Puerto Rico Conservatory International Percussion Festivals, the Open Ears Festival of New Music’s Environmental Rhythms event as well as numerous state and provincial PAS Day of Percussion events. His compositions appear with Keyboard Percussion Publications, Alfred Publications, Studio 4 Music, House Panther Press, and Bachovich Music. He has received grants from the Ontario Arts Council, Canada Council for the Arts, Social Sciences Humanities Research Council, and Canada Foundation for Innovation. Papador is an artist endorser for Vic Firth, Sabian, and Yamaha. He is the president of the PAS Ontario Chapter. This page was last modified on 22 May 2015, at 14:53.